The Munich startup Hawa Dawa is committed to air quality. Which is appropriate considering that air pollution control is currently the focus of intense debate in Munich. Hawa Dawa has been working on the problem since 2015. We spoke with CEO and founder Karim Tarraf. In Arabic, the term “hawa dawa” roughly means clean air. That was what Karim Tarraf, who grew up in Cairo, named his project that won the “Think. Make. Start.” Hackathon of the Technical University of Munich in spring 2015. The focus was different back then with a prototype for a mobile device for asthmatics. 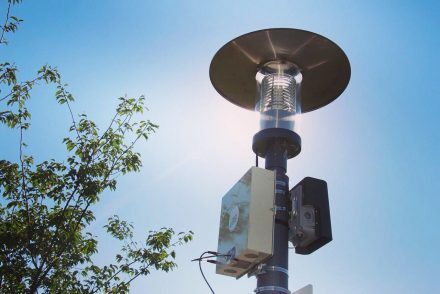 But even then, the founder had the vision to implement measures for improved air quality and a better quality of life in cities using comprehensive air quality data. Karim Tarraf, co-founder and CEO of Hawa Dawa. Karim has gotten very close to achieving that vision in the last three years. 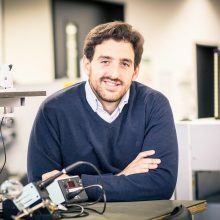 He founded the company Hawa Dawa together with his wife Yvonne Rusche (COO) and the couple Dr. Birgit Fullerton and Matt Fullerton as well as Jannai Flaschberger (CTO), “pretty much as a family-run company,” said Karim. There were plenty of discussions and countless iteration loops on their joint path to success, as well as many conquered obstacles and valuable support from the startup network. First, they were accepted by the incubator offered by the fellowship program “Eight Billion Lives” and moved into Impact Hub Munich. They then became part of the support initiative Climate KIC; followed immediately by the Xpreneurs program, and after that were invited to be a part of the Swiss Kickstart Accelerator. Just recently, the startup was accepted by the ESA BIC Incubator and is now tinkering with an intensive link between their product and satellite data. The startup has also been honored with a multitude of prestigious awards and won prizes at various national competitions, such as “Digitale Innovationen.” The programs and awards not only allowed them to continue developing the product, but also expanded the founders’ network. For that reason, Hawa Dawa is now starting a financing round and is looking for new companions with a passion for smart cities, sustainability and internationalization. After all, the market is opening up to “smart city” topics, and with a new round of financing, that’s precisely the market the Munich startup wants to tap into. Both municipalities and the private sector have realized it’s time for less of a silo mentality and for more of a holistic approach. Hawa Dawa develops the right products for the trend. The young company’s number of employees has tripled over the last 18 months, which is allowing the clean-tech startup to continue in-depth development of their product, strengthen their reputation and expand its sustainable network even further. The CE-certified solution by Hawa Dawa works as follows: The startup delivers real-time data about air quality using its combination of hardware and software. Affordable and compact sensor boxes, which can be energy self-sufficient thanks to solar energy, are distributed in different parts of a city. The data acquired by the boxes is calibrated using machine learning methods, combined with additional data such as traffic or weather data and then analyzed using smart algorithms on an AI-supported software platform. The result is a unique, comprehensive live image of air quality whose accuracy lies within the legal requirements for model-based measurements for many applications. Based on the real-time environmental data that is collected, clients such as municipalities or telecommunication or logistic companies can then develop measures that combat air pollution and improve traffic planning, climate strategies and city planning. said Karim. That is why Hawa Dawa also offers its clients recommendations based on environmental data and concrete requirements. The founders have plenty of ideas for innovative features and intelligent products. The city of Munich is also one of the startup’s pilot clients. In the EU project Smarter Together, Hawa Dawa constructed measurement stations in the project area Neuaubing, Westkreuz and Freiham to collect environmental data. In addition to Smarter Together, the Bavarian capital city is also involved in further projects focused on “smart mobility,” such as City2Share and Civitas Eccentric. The latter startup has also installed measurement boxes in Domagkpark and Parkstadt Schwabing. In addition to Munich and international enterprises, the startup also currently has four additional cities as clients. For the project “Smarter Together,” Hawa Dawa constructed measuring stations in Neuaubing, Westkreuz and Freiham. Hawa Dawa views environmental data like Lego bricks for all urban activities, from event organization to traffic planning. Those activities would either be implemented directly by the innovative young company or by clients who have received the right tools from Hawa Dawa. In addition to continuous feedback, sustainability is also an extremely important topic for the founders of the Munich startup. Karim Tarraf and Yvonne Rusche met during their previous jobs working on the United Nations Environmental Program. While there, they both felt they were doing something useful. But the impact made by Hawa Dawa, its momentum – that is something the founders would have never achieved in “normal” jobs. Developing and emerging countries are also dear to the hearts of the international team, which includes members from eight different countries. These areas hold great potential, considering that more than 100 countries do not even have measurement stations because the complex technologies are too expensive and primarily developed for wealthy countries. As a result, the next step for Hawa Dawa to take – after their first stage of expansion in further EU countries – is also clear: To use their affordable and scalable technology in developing and emerging countries as well. Thanks to their international team and expansive network, they already have good contacts.